Earth Day weekend sees volunteers unite for annual Clean Up the Park Day. 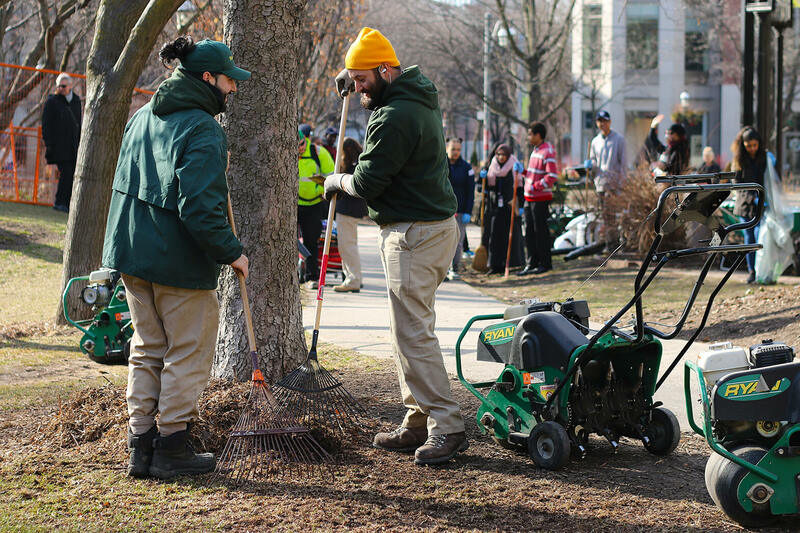 Volunteers began the clean up by raking the turf in the park. 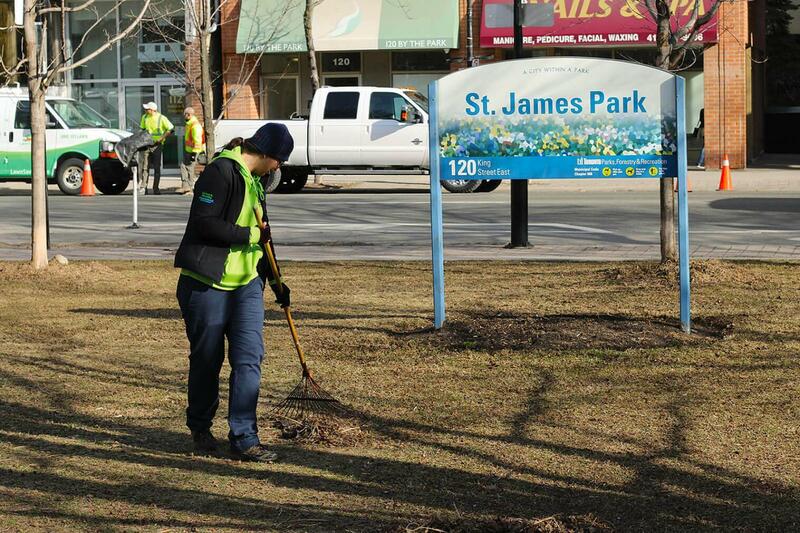 The seventh annual Clean Up the Park Day at St. James Park in downtown Toronto saw dozens of volunteers enjoy a few hours working outdoors to transform and revitalize the vital green space for all those to enjoy. In the early morning of April 21, crews from several Landscape Ontario member companies arrived on site, unloaded their tools and equipment, and gathered at the park’s gazebo to go over the game plan for that morning. Organizers Kyle Tobin and Alan White, members of Landscape Ontario’s Turf Management Sector Group, thanked the over 30 volunteers from Landscape Ontario member companies and gave a brief history of the event. Tobin, owner of LawnSavers Plant Health Care in Concord, Ont., explained the clean up became an annual tradition after the park was fully restored in just two days by volunteers and suppliers from the landscape profession back in 2010. “Every Earth Day weekend since, we come back here and we rake, aerate, seed, fertilize, to make sure this park, that gets a tonne of use, stays healthy and green and producing all of the environmental benefits that we can all enjoy.” Tobin says the annual clean up is a means to ensure that initial volunteer effort was not wasted. White, owner of Turf Systems in Burlington, Ont., thanked the many volunteers for attending and explained the strong relationship that has ensued over the years with local residents and the St. Lawrence Market BIA, a partner in the event from the very beginning. 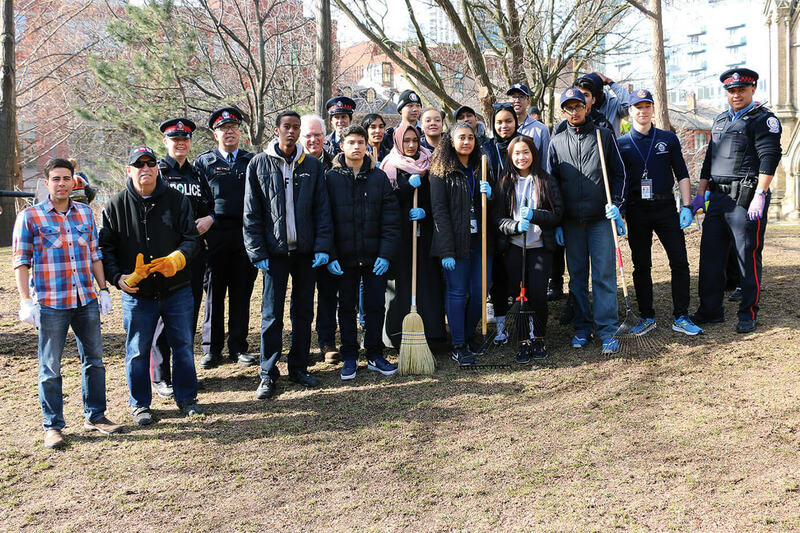 Community volunteers included members of Toronto Police Services and its youth program. Bob Kemp, St. Lawrence Neighbourhood Streetscape Coordinator, has been taking care of the park for 20 years. He, along with Tobin and White, were able to pull off the major park restoration back in 2010 and have continued to maintain the park meticulously ever since. Kemp also coordinated the participation of Toronto Police Services in the clean up this year. Several uniformed officers arrived to lend a hand with about two dozen youth from the Youth in Policing Initiative (YIPI). Started in 2006, the YIPI program employs a number of diverse youth between the ages of 15 and 18 years old from priority neighbourhoods across Toronto, with the goal of providing them exposure and experience in a work environment. Atkins says her work “to help establish a nice green space for people to enjoy” is one reasons why she volunteered, adding not only does it help her to feel good, but it also helps to instill a love of nature for the many kids and young people from the local community who helped out. Holly Howitt, a hairdresser at World Salon that overlooks the park, says her entire workplace participated in the clean up because the goals of the event align with those of her workplace. “The salon has always made lots of effort to be sustainable and eco-friendly and it just seemed like a natural extension of the value of the salon to pitch in with the community and help with the maintenance of the park,” Howitt says, adding the salon’s owner also takes care of the gardens on the corner of Adelaide and Jarvis in the park. Lindsay Renner, a horticultural technician with Clintar Landscape Management, spent the morning picking up debris and raking. “This park is centrally located and there’s pretty much nothing like it in the area,” Renner said. “Where I live, there are parks everywhere, so I can’t even imagine living downtown and not having a park.” Renner said she volunteered for the event in order to help keep the park looking green all summer long for kids and the local community. Equipment, labour, tools and supplies for the park clean up are provided at no cost to the city. About 30 people from the local community worked alongside the landscape profession, cleaning out garden beds, raking, and picking up debris. Among those were local residents, Bob Tubby, founder of Arbordale Landscaping in Markham, Ont., and Chris Clayton, owner of Christopher Clayton Landscape Architect, in Toronto, Ont., both seasoned volunteers with Landscape Ontario. Organizers would like to thank: sponsors Plant Products and Lawn Life; the St. Lawrence Market BIA (for providing coffee and food for volunteers); volunteer crews from Allweather Landscape, Clintar Landscape Management, LawnSavers Plant Health Care, Turf Systems, Weedman; Bob Kemp, Toronto Police Services; and the many volunteers from Landscape Ontario and the local community.